Getting started with concealed carry can be a bewildering process for the new shooter, and it’s easy to stumble over the little details. For instance, now that you’ve got your new carry piece, have you thought about how you’re going to carry it? As time goes by, you may find that concealed carry depends more on a system of related gear rather than a collection of standalone items. 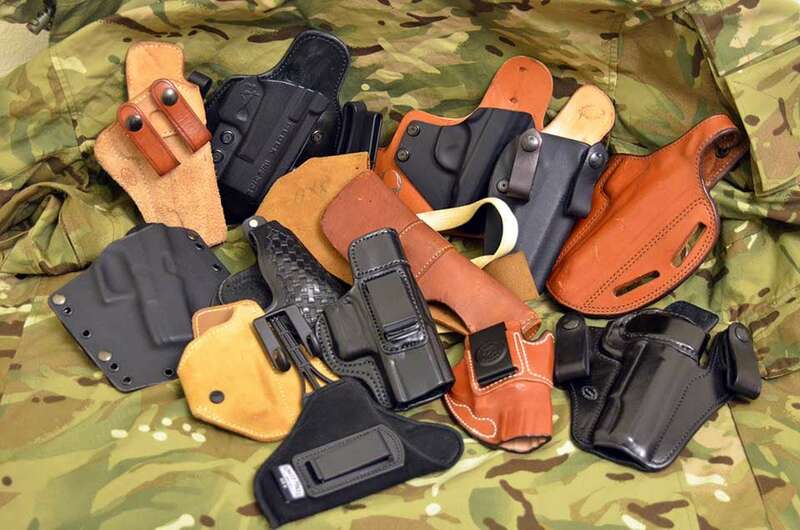 Holsters can be had in so many styles, sizes and colors, choosing a holster (especially the right one) can be daunting. 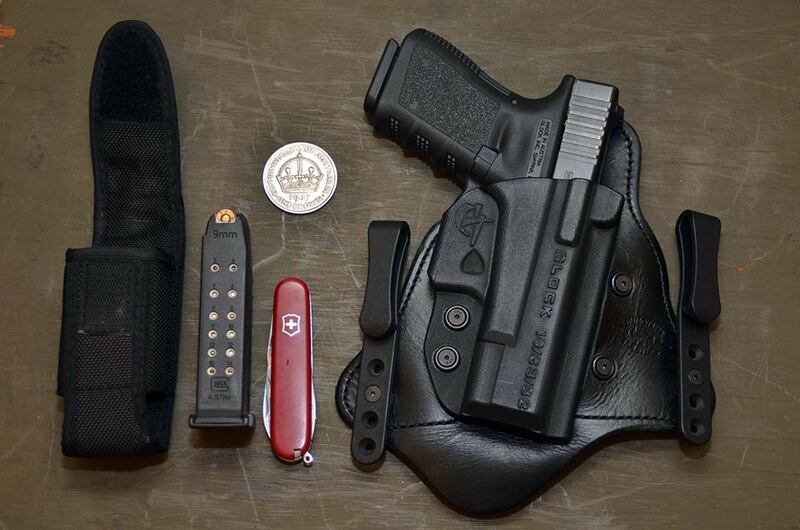 One way to narrow the field is to take a few minutes and seriously think about how you intend to carry your pistol. Inside or outside the waistband? What position? How will you carry your spare magazines? 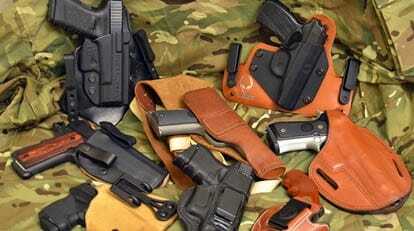 What types of clothing will you typically wear with your concealed carry rig? Concealment holsters can take many forms, and some of the older designs, like the Milt Sparks Summer Special and its numerous clones, consist of a simple leather holster with two belt loops that go over the waistband of your trousers, and these work well for carrying your pistol from between the three-thirty and five-thirty positions (for those unfamiliar with the clock system, think of your belt buckle as twelve o’clock). 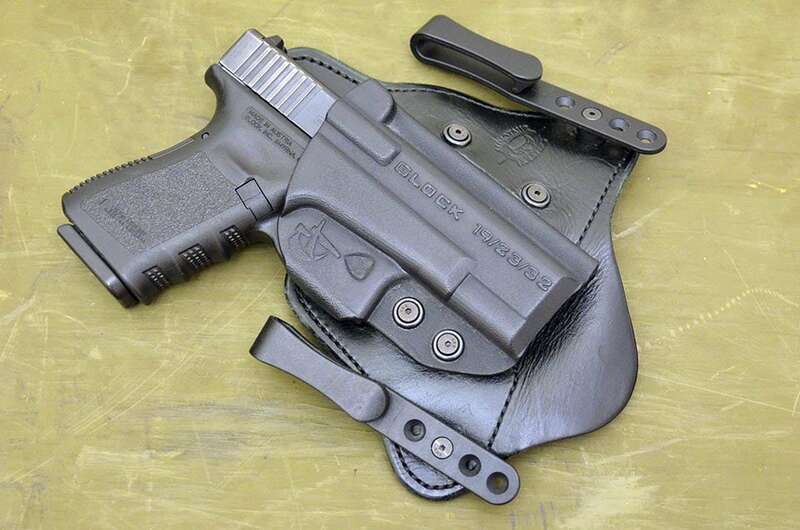 Other designs use hooks, clips or straps to secure the holster to your waistband or belt, and offer numerous options to tailor the rig to your needs. For those on a serious budget, Uncle Mike’s carries inexpensive but durable neoprene sleeve holsters with small plastic belt clips that might not be the most ‘whiz-bang’ tactical rigs in the world, but they get the job done until you can do better. 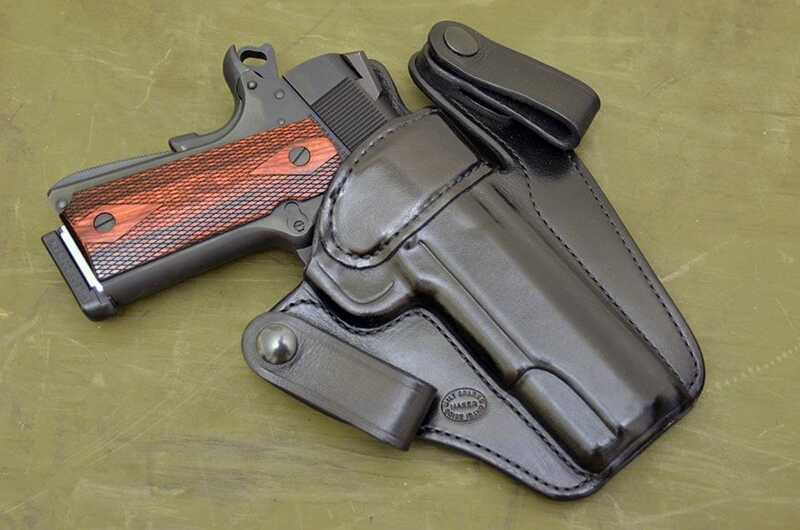 On the opposite end of the spectrum, you can get hand-crafted, elegantly carved custom holsters or complete rigs made with exotic skins that will set you back as much as a decent pistol. Buy the best you can afford, because quality gear pays for itself during those moments when you really need it. There are literally hundreds, maybe thousands of variations on this theme, and while times, tactics and rigs may change, the necessity of keeping your pistol secured but readily accessible does not. I’ve become a huge fan of the hybrid inside-the-waistband (IWB) holster, because it can be concealed under just about any garment, winter or summer, and these holsters are usually very versatile, in that you can set them up to position the pistol low or high, straight or canted, however suits you best. My current IWB favorites are the Milt Sparks Versamax II and the Comp-Tac MTAC, but I’m always on the lookout for new gear, and the huge number of manufacturers means I’m never disappointed. Outside-the-waistband (OWB) carry will work if you habitually wear a coat, if you’re a law enforcement or security officer or if you’re fortunate enough to live in an area where open carry is both legal and unlikely to cause wholesale panic. Even so, carrying in this fashion requires some attention to detail, because if your cover garment rides up or you bend over to pick something up, the bottom half (at least) of your holster is plainly visible for everyone to see. One of the major downsides to OWB is that the holster is much more detectable by the people around you, including some who might not have your best interests at heart. Shoulder holsters are a little old fashioned, and consequently, you can find some pretty good deals on them if you shop around the gun forums. I bought a vintage Lawrence tow-plug leather shoulder holster for my five-inch 1911 for the kingly sum of $35, and it’s surprisingly useful and comfortable under a winter jacket. It’s not really suitable for summertime wear, and you will have to make sure your jacket fits well without flapping open too much, or you risk alarming those easily frightened souls who don’t share our enthusiasm for these things. Incidentally, the best tailors will be only too happy to cut your suit coat to fit properly around a holster, a surprising fact I recently discovered on a haberdashery forum. Most summertime clothing isn’t really conducive to concealing a handgun, but innovation has done us a lot of favors in recent years, and there are now incredibly small pistols, like the Diamondback DB9 or Sig-Sauer P238, available in decent calibers which can be concealed under just about any type of clothing. Some still prefer the old style of hideout guns, like the trusty Smith & Wesson J-Frame or various flavors of pocket autos and even steel framed Colt Commanders. 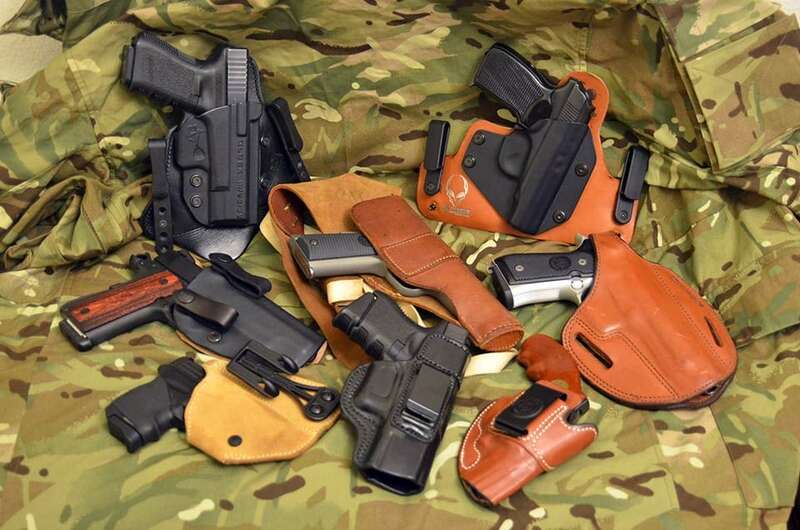 What’s really great is that holster technology has grown by leaps and bounds, which makes carrying even older, heavier guns much less of a hassle than it used to be. Most experienced shooters will not have much in the way of clothing-related issues after years of experimentation, but novice shooters will more than likely seek out some guidance on this and other concealed carry subjects. With that in mind, we should all be prepared to listen and help where we can if our friends and/or loved ones decide to start carrying and discover that it’s a lot more complicated than just buying a gun and throwing it in a pocket or purse. Depending on the environment or situation, you may not be able to carry the best or most comfortable pistol in your collection all the time, but there is a carry solution available for just about every modern weapon. There are more people are getting into concealed carry every day, which means that our options are becoming more numerous as this burgeoning market expands. The only problem we have is deciding which setup is the right one, but that’s a matter of taking the time to learn the ropes and having the patience to choose wisely according to your needs. Do your research, plan carefully, shop ten times and buy once!